Paint, Windows 7’s improved drawing program, lets you express your creativity with a number of photo editing tools. 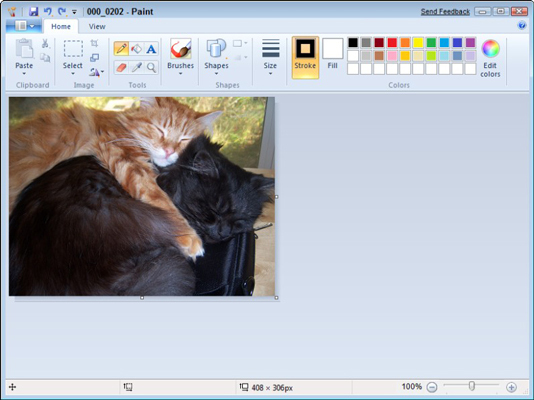 You can edit photos using Paint in Windows 7 by adding text, changing colors, and other effects. Click the application icon and click Open. In Paint, the application icon is near the top-left corner with a picture of a little document on it. 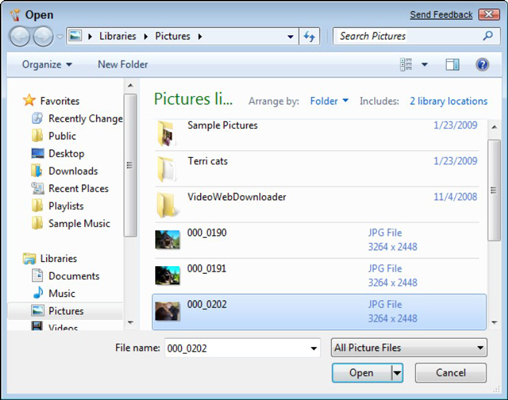 Locate and select a picture file that you want to edit and then click Open. Your picture will open in the Paint window. Check out the various editing tools. Edit colors. Choose a color from the color palette on the Home tab to use with various tools (such as Brushes, Fill with Color, and the Pick Color dropper) to apply color to the image or selected drawn objects, such as rectangles. You can create your own custom color palette. Click the Edit Colors button. Click various colors to add to the palette and then click the Add to Custom Colors button and click OK to save the modified palette. Select areas. Click the Select button and then choose a selection shape, either Rectangular or Free-Form. Click and drag on the image to select portions of the picture. If you want, you can crop to only the selected elements by clicking the crop tool. Add text. Click the Text button and then click and drag the image to create a text box in which you can enter and format text. Draw objects. Click the Shapes button and choose shapes, such as Rectangle, Rounded Rectangle, Polygon, or Ellipse, and then click and drag on the image to draw that shape. Modify the image. Use the buttons on the Image section of the Ribbon to stretch out, flip around, or change the size of the image. Alternatively, you can click the Paint button and then choose Print or File→Send in an E-mail.